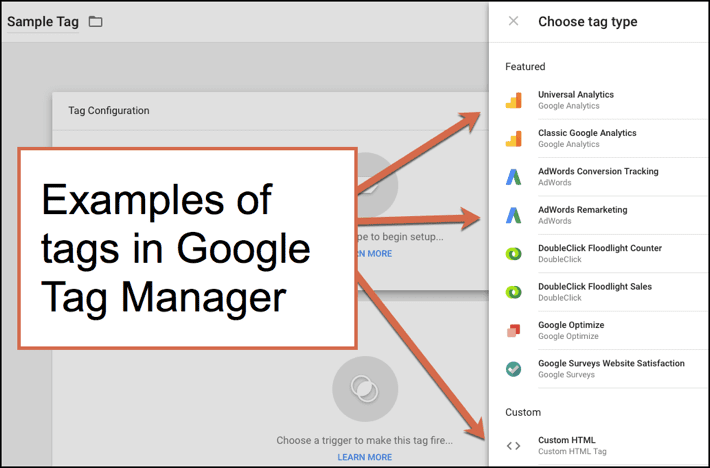 What is Google Tag Manager and why use it? The truth about Google Tag Manager. If you’re not that familiar with Google Tag Manager, you are probably wondering what it is and why you should use it. Let’s answer the most common questions around Google Tag Manager. How is it different from Google Analytics? Why should I use Google Tag Manager? What can I track in Google Tag Manager? Where can I learn more about Google Tag Manager? 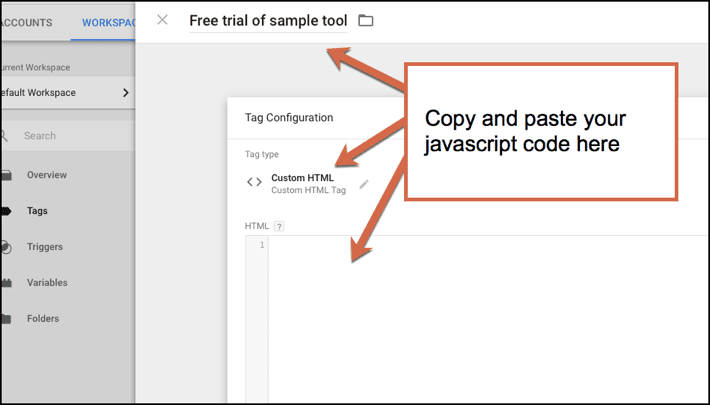 Google Tag Manager is a free tool that allows you manage and deploy marketing tags (snippets of code or tracking pixels) on your website (or mobile app) without having to modify the code. Here’s a very simple example of how GTM works. Information from one data source (your website) is shared with another data source (Analytics) through Google Tag Manager. GTM becomes very handy when you have lots of tags to manage because all of the code is stored in one place. Sounds easy right? Unfortunately, it’s not that simple. Is Google Tag Manager easy to use? They say it’s a “simple” tool that any marketer can use without needing a web developer. I may get run over in the comments section for saying this, but I’m standing my ground. Google Tag Manager is not “easy” to use without some technical knowledge or training (courses or self-taught). You have to have some technical knowledge to understand how to set up tags, triggers and variables. If you’re dropping in Facebook pixels, you’ll need some understanding of how Facebook tracking pixels work. If you want to set up event tracking in Google Tag Manager, you’ll need some knowledge about what “events” are, how Google Analytics works, what data you can track with events, what the reports look like in Google Analytics and how to name your categories, actions and labels. Although it is “easy” to manage multiple tags in GTM, there is a learning curve. Once you’re over the hump, GTM is pretty slick about what you can track. 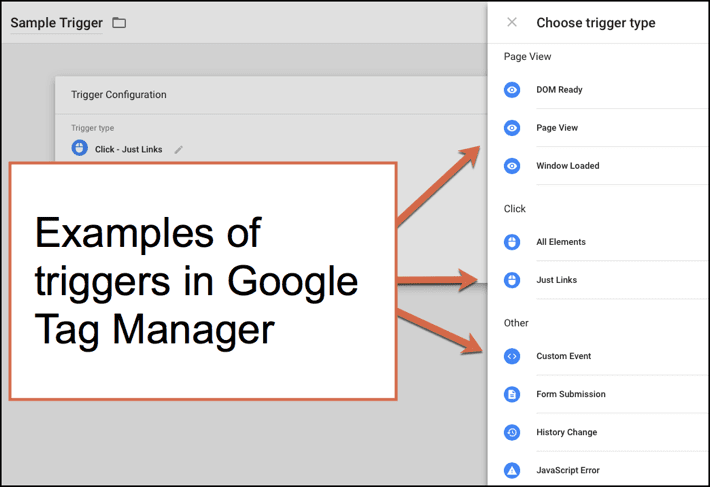 “Google Tag Manager has made the process of managing analytics and marketing tags easier than ever before. With this, most marketers do not realize what Google Tag Manager is actually doing and what happens when mistakes are made. At Analytics Pros, we never recommend anyone use Google Tag Manager on their live site without a few months of training and experience. GTM is injecting code directly on the site, which means while unlikely, there is a possibility could break your website. Tags are snippets of code or tracking pixels from third-party tools. These tags tell Google Tag Manager what to do. Triggers are a way to fire the tag that you set up. They tell Tag Manager when to do what you want it to do. Want to fire tags on a page view, link click or is it custom? 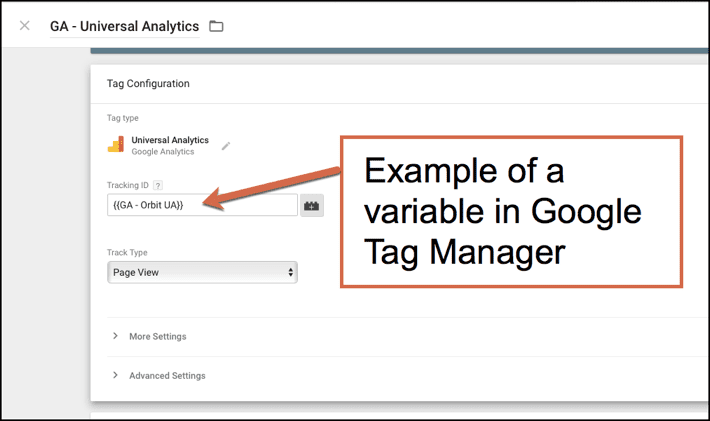 Variables are additional information that GTM may need for your tag and trigger to work. Here are some examples of different variables. The most basic type of constant variable that you can create in GTM is the Google Analytics UA number (the tracking ID number). Those are the very basic elements of GTM that you will need to know to start managing tags on your own. If you’re bored reading this right now, you won’t have any issues managing your tags. If you are completely lost, you are going to need help from someone more technical. 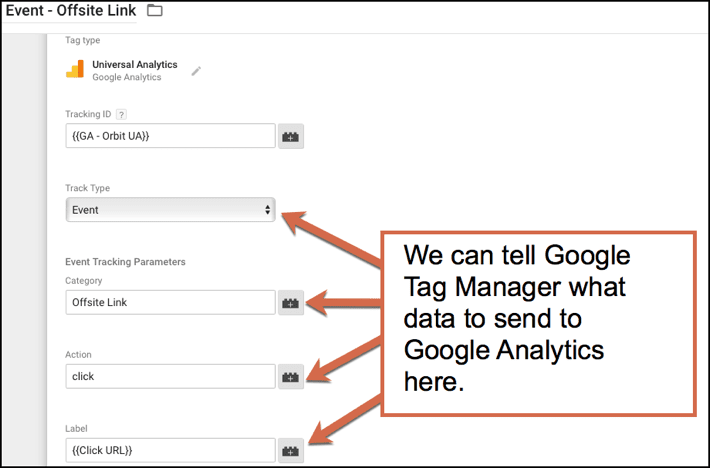 How is Google Tag Manager different from Google Analytics? Google Tag Manager is a completely different tool used only for storing and managing third-party code. There are no reports or any way to do analysis in GTM. Google Analytics is used for actual reporting and analysis. All conversion tracking goals or filters are managed through Analytics. All reporting (conversion reports, custom segments, ecommerce sales, time on page, bounce rate, engagement reports, etc…) are done in Google Analytics. What are the benefits of Google Tag Manager? Once you get over the learning curve, what you can do in Google Tag Manager is pretty amazing. You can customize the data that is sent to Analytics. You can setup and track basic events like PDF downloads, outbound links or button clicks. Or, complex enhanced ecommerce product and promotion tracking. Let’s say we want to track all outbound links on the website. In GTM, choose the category name, action and label. We chose offsite link, click and click URL. 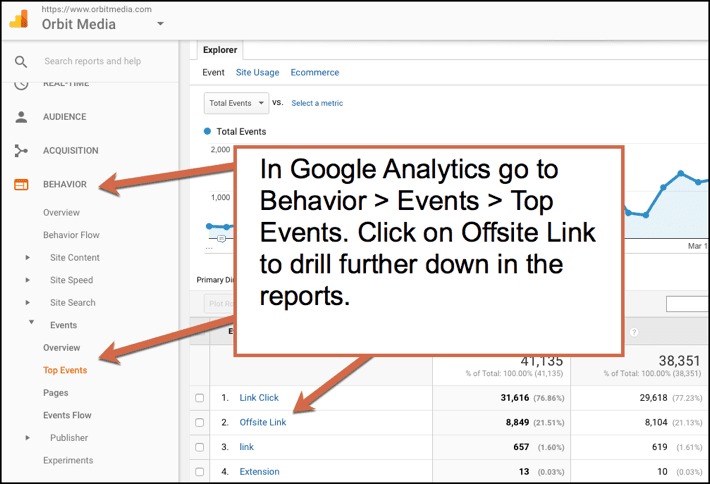 In Google Analytics go to Behavior > Events > Top Events > Offsite link. Now select either event action or label to get the full reports. The data that we setup in Google Tag Manager is now appearing in the Analytics reports. Nifty! Want to try out a tool on a free trial basis? You can add the code to Tag Manager and test it out without needing to get your developers involved. It may help your site load faster depending on how many tags you are using. It works with non-Google products. Flexibility to play around and test out almost anything you want. All third-party code is in one place. GTM has a preview and debug mode so you can see what’s working and what’s not before you make anything live. It shows you what tags are firing on the page. Love this feature! 1. You must have some technical knowledge, even for the basic setup. 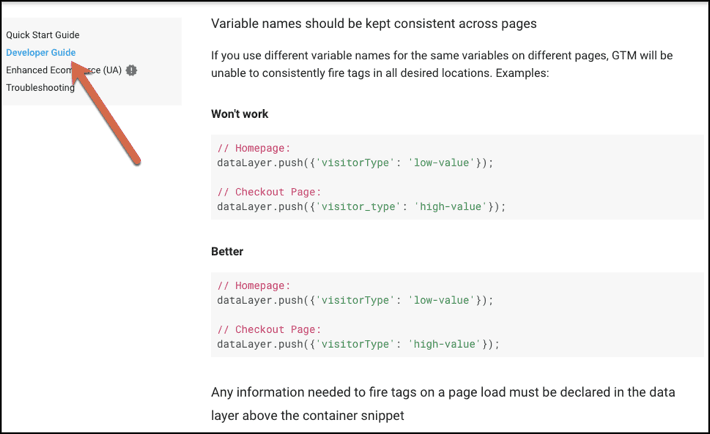 Check out the documentation from Google on how to setup Google Tag Manager. Once you get past the “Quick Start Guide,” it takes you to a developer guide. Not a marketer’s guide. If you are a first time user, this will read like gibberish. 2. It’s a time investment. Unless you’re a seasoned developer, you will need to carve out a chunk of research and testing time. Even if it’s reading a few blog posts or taking an online class. 3. Make time for troubleshooting issues. There is a lot of troubleshooting that takes place when setting up tags, triggers and variables. Especially if you are not in Tag Manager regularly, it’s very easy to forget what you just learned. For more complex tags, you will likely need a developer with knowledge of how the site was built. What can you track in GTM? “One of my favorites is content grouping in Google Analytics combined with Google Tag Manager. It allows you to define content groups by Rules/Macros. You can then see which elements of your blog posts (e.g. images, videos, length, title length) lead to the most conversions, longest time on page, etc. 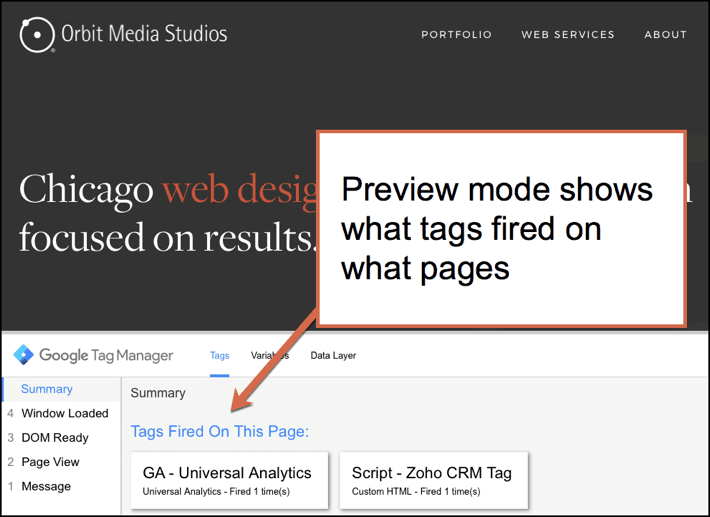 We are just scratching the surface of what you can do in Google Tag Manager. The possibilities seem almost endless. But, as Himanshu Sharma points out, the more tags and data sources you have the harder they are to manage. I took a live course through Conversion XL with Chris Mercer. It was one of the best online classes I’ve taken. You can purchase the recordings if you are interested. Your turn. What do you think of Google Tag Manager? Google Tag Manager can definitely make your life easier if you are willing to learn how it works. Make sure that you are actually using the data that you are setting up in GTM. Otherwise, what’s the point? I’m curious to hear your experience with Google Tag Manager. Has it been easy or hard? How are you using it in your marketing? 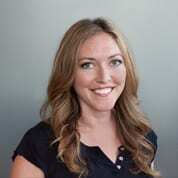 Amanda Gant is the Marketing Director at Orbit Media and organizer of Content Jam, Chicago's largest content marketing conference. You can find Amanda on LinkedIn and Twitter. That is an excellent way to describe GTM. How are you using it? Any cool tricks you want to share? I didn’t realize it, but I’ve been waiting for this post. Thank you! Thanks for leaving a comment. I agree. The tool is pretty amazing. How are you using it for SEO purposes? I’d love to share (and learn) how everyone else is using it. I use it to dynamically generate schema data that google uses for structured data and rich cards. It is making it much easier to manage a large eCommerce site on a platform like wordpress. Can you please tell us more about how you’re using it for schema? I’m currently working on developing it for a site that I manage. Thanks! Ohhhh I’m curious too! Mind if I shoot you an email? Love the post because it taught me a few things about Google tags, and helped me acknowledge that I and my website are not yet ready to mess with GTM. It’s great to know where the deep water is when you haven’t yet gotten good enough to swim in it. Thanks Amanda! Great summary of the post. Although, anyone can use it, not everyone is ready to use it. It’s a powerful tool once you figure it out. Still learning every day what the possibilities are! Thanks Amanda. As always, helpful and honest — and those are two things no marketer can get enough of! It sounds like a case study might come after this post (hint hint) and I can’t wait. One question — is it you doing the tagging or who is at Orbit and what kind of strategy do you have in place, meaning, are you guys tagging the jebesus out of everything now? Or just more strategic pieces? It’s mostly me, Andy and some of our developers. More of the complex tagging that we are doing for clients has to involve our dev team. It’s too complicated for someone (me) that doesn’t have a deep technical knowledge. Especially for enhance ecommerce tracking scenarios. At Orbit, we are only tracking things that we plan to analyze or use for R&D. Right now we are tracking outbound links and all link clicks. As an example, I wanted to know who’s clicking on certain industries within the filter of our portfolio. All link clicks is sending me that data. For clients, it’s all over the board what we’re tracking. Some of it’s pretty simple, others are really complicated. Usually involving several other third-party outside vendors. Hope you’re doing great, Kelly. We miss you! I had confusion about the use of Google Tag Manager until recent days. Then I customized analytics using GTM to reduce bounce rate on my site. Now I can say that it’s an awesome tool which offer wide range of customization opportunities on analytics. Your writing gave me detailed knowledge on the use of GTM. Thanks a lot for the post. I recently started setting up Google Tag Manager for all my analytics clients. The reason was that those companies are clients who track a lot, and GTM helps them scale tracking codes as they grow. I have also been using it for more and more of my AdWords clients. That way, I can launch campaigns quicker thanks to a smaller need for a developer when setting up conversion tracking. I’ve also found that for campaigns where bookings use partners such as Inntopia, GTM makes integration between our own site and the 3rd party booking site easier. Great intro post! Explaining GTM is a nightmare usually and you did really well. I learnt really the hars way how to use it . It took me time to get used to it. But now, i’m never adding third party scripts on any site without GTM. I’m tracking links as you do, I am also using it with AB experiments. But the most important thing for me is that I can use it to send data about my users to all third-party scripts (using the data layer). For instance, when my users login I can start the chat widget with their names. I totally agree. Once you get the hang of it, there’s so much you can track. Thanks for the comment and kind words, Jean-Christophe! This is a helpful post, Amanda! I remember the first time I fiddled with GTM; I, too, was disappointed that it wasn’t as “simple” as Google had let on. Interesting, didn’t even know about GTM until today. Thanks for sharing Amanda. You guys are AWESOME. I’ve watched 4-6 Youtube videos telling menhow to set Tag Manager up and none of them has clearly explained what exactly GTM is and what it’s used for. There’s a big difference between dispensing information and teaching. How can we learn the tags for clicking the add to cart attribute or dropping it? Any bright ideas? I love how simplified this is! Thanks for sharing. Hi. I watched a YouTube video I how to set up my GTM. But since I started advertising 1 week now. My bounce rate is mainly 0.00% on many pages and a few are showing 7% and other 20-30%. My developer added Google analytics code to my site. Could it be that GTM is causing duplicate tags and therefore giving me a 0.00% bounce rate.? I wanted to learn GTM from the past few months and here I can see the best piece of blog post to get started with. Thank you for the wonderful post. Bookmarked it for the future reference too.